We are GO for Krazy fest! It’s official, we are going out with CONVERGE. Hey guys, we goofed this by retweeting a jpeg someone lifted off of the back end of converge’s site, but it’s official now after much speculation. 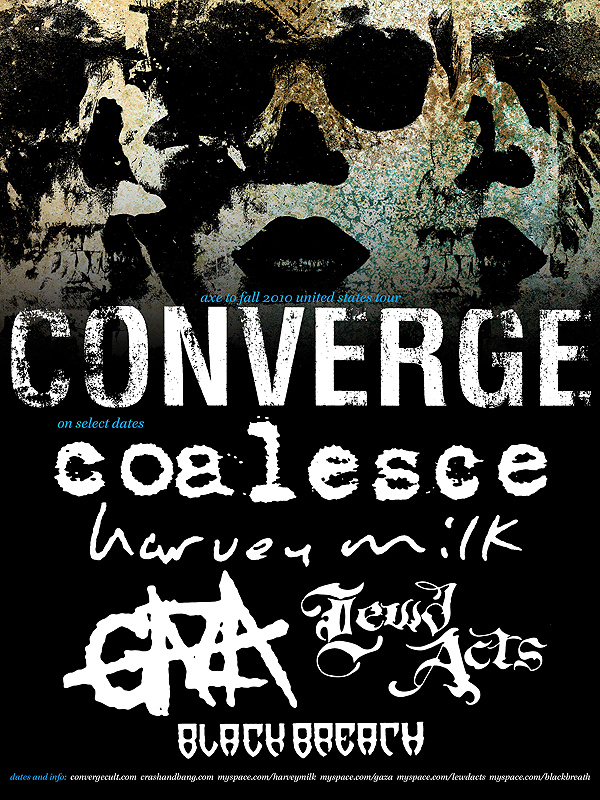 We are going to be picking up the last of our 2010 touring with converge to get to the midwest and the west coast. Here are the full dates. And a video of what’s to continue into 2010. We are touring with Harvey Milk and The Atlas Moth! There are already some rumors about our other tour later this spring, but it’s nothing but rumors at this point. I can tell you that we planned our tours to where we could get across the entire united states and not loose our day jobs. So in short, if you are waiting for a Coalesce show in the nyc area, come see us with Harvey Milk and the Atlas moth, because we won’t be back later on another tour. OXEP Preorder up now! Preview song up now! 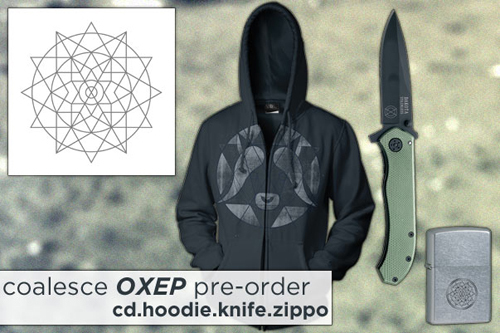 Hey guys, just a quick note that OXEP comes out Nov 10, and we have a rad preorder package put together for you. We are doing a classic brand name zippo, a Dakota pocket knife, and a really nice OX zip hoodie by Micah Smith. CLICK HERE FOR THE PREORDER. The Zippo is a name brand quality lighter, and we’ve done it in a classic silver worn look. The OX icon is engraved in the face in a classic set up. As an added bonus, we are making some chase lighters in black matte and gold. Only 1 of each is being made, and random customers will get them unless specified that they do NOT want a one of a kind lighter. All lighters are being made to order. If we only sell 1, then only 1 of these will exist. The Dakota pocket knife was chosen as a useful work tool. Sean from Coalesce searched for hours looking for the best quality knife, with the best features. Having the blade black is a huge bonus. The Ox icon is engraved on both sides of the blade. This too is being made to order. No chase colors on the knife. We haven’t had a new hoodie in a long time. We are super excited to see Micah Smiths Ox poster design used in such an appealing way. We decided to go with american apparel on this item, and it again is being made to order. Please note that we split the preorder items from the actual ep. Everything is sold separately. So if you download a leak from wherever, you can still support the band and get something unique and useful. We have approved the test presses for the 12″ vinyl, and they should be on time as well. We will have our copies of the vinyl up for preorder in all colors as soon as we can go through the boxes and know exactly what we have. You can go over to our myspace page and check out a track from OXEP right now. CLICK HERE TO PREVIEW A NEW OXEP TRACK. We chose “Through Sparrows I rest” as the first track for you to check out. A little note on the song, that’s not a missle at the end, that’s Sean’s 12 year old daughter backing her dad on vocals. 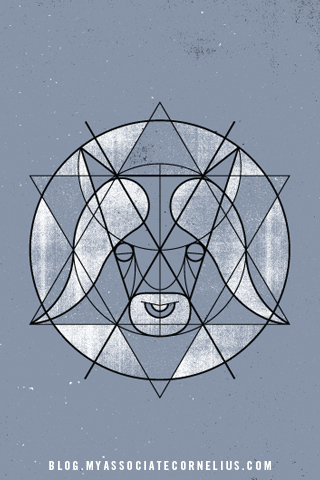 We believe the entire OXEP will be available for streaming on Lambgoat.com soon enough. Thanks so much for your continued support of this band and our art. Hey folks, we just returned from a whirlwind week thanks to the generosity of the kind folks at Scion Motors and Beyond Marketing. A seriously heart felt thanks to everyone involved, and everyone who took time out of their evening to come out and see us and the incredible CAVE IN play. Next month is when OXEP comes out on Relapse Records, and we figured we would give you a little more information about this release, since we’ve seen a lot of confusion and inaccurate descriptions as to what exactly this is. 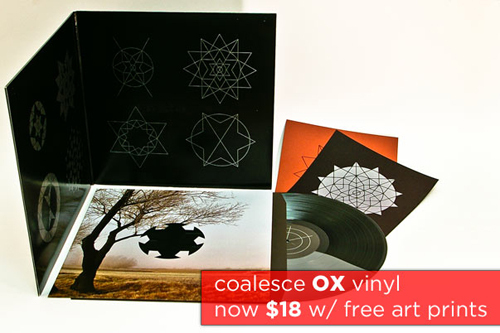 OXEP (not “ox” ep) is 5 new original coalesce songs. There are 7 tracks, but 1 and 7 are a percussive intro and outro. These songs are not cuts that didn’t make ox. We wrote and recorded these songs specifically for an ep release after ox was already done and delivered to Relapse for production. We continued our americana theme and expanded them on these songs, therefore wanted them to be considered part of the 2009 ox sessions. Don Clark returned for the layout and design of OXEP with a pared down presentation as final price was of a major concern. The CD version will sell for $8.00 and the LP pricing will be announced once projections are back in. LP version will be gatefold again, with multiple colors of vinyl for collectors. Relapse is running a preorder right now, and we will have ours up shortly with more unique premiums like a zippo, and pocket knife. Thanks again for all your support and kind words regarding OX. We have been shown a welcome warmer than any band could hope for. Updated! Remix Wild Ox Moan, plus uploading instructions. ” Go HERE to the Coalesce remix page. If you’re not yet a member, click Signup in the top right corner of the page. Provide your name, email and a password and you’ll soon be a member! Once you’re a member, you can Ask to Join. After you are accepted into the session, you can make comments, record, edit or upload a mix and more. To start a mix using Indaba’s online recording software, click Record, Edit, Mix. This will launch the Session Console. To access to the files for download, click on View All in the files section on the right. In the actions bar next to each track, you can select download. And then you can go ahead and mix the tracks using your own music software. We’ve noticed that a lot of folks are uploading their mixes on their myspaces, and other new sharing media blogs. That’s all good, but we would like to have all of the mixes in one place so we don’t have to hunt all over the net. That is if you want to be in the drawing for the prizes. Not familiar with Indaba music? Indaba Music is a global community of over 250,000 musicians and technology that enables artists from 185 countries to create music together and manage their musical lives. Members share, archive, and promote their music; learn from instrumental legends and industry vets; compete in interactive campaigns with major artists and connect and collaborate in online recording sessions, all using the service’s groundbreaking Digital Audio Workstation. 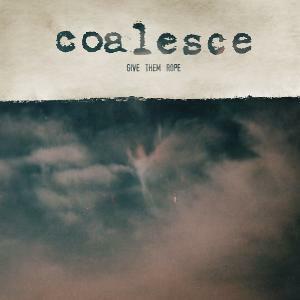 In short, coalesce is the first heavy artist to have a featured session, and we couldn’t be more honored. OX going into 2nd press soon, get last of 1st press now. “Already?”, that’s what we thought too. But it’s true, ox is going into second press with a low number, and we still have our share of the (1st press) vinyl since we’ve been in Europe this whole time. We have all versions available to the public online now. We lowered the price and are even throwing in some freebies to sweaten the deal. Cd: There was a mishap with some of the cutting on the Art set. Sean wanted some bookmarks for himself, and just kinda kept making them until he ran out of thread. they turned out beautiful. Cd and bookmark are only $12.00. Get it HERE. Lp: There were a few test prints left over of the artset, and enough to include 2 random prints with each Lp. Vinyl and art prints together are now only $18.00. Get it HERE. European Merch designs: We only had a handful of shirts left over so we opted to take them home. These are the 3 designs that we had on sale in Europe and England. They are printed on Gildan ringspun tees and ink is discharge. Get them HERE. These were posted a month ago, but seeing Micah’s amazing interpretation of the Ox art got me reminded to post this again. If you have an iphone, and want to sport some coalesce ox art by Don Clark, Please point your browser HERE, I uploaded a ton in a folder for you. Don’t miss this amazing wallpaper by good friend Micah Smith. You can also buy the hand silkscreened poster of this art here if you are so inclined. As for the iphone wallpaper below, right click, save as, put on phone and live it.